Apparently, I’ve been writing a lot about students and language. The words writing and tests were also quite big on the cloud, maybe because I’ve written two recent posts on these topics. However, I guess I’ll look at this from a different perspective and try to give meaning to the way the words appeared together, shall I? The first thing I noticed was the position of the words L1, English, far, big, and things. When looking at this, I thought about the fact that, yes, learning a foreign does open doors (excuse me for the cliché), it’s something I’ve been thinking about a lot recently. If Google and other companies are finally able to perfect online text and voice translators, why would anyone care to go through the hardships of learning a foreign language, say, in 15 years’ time? I guess the answer is that learning other language apart from your L1 allows you to do far bigger things and accomplish a lot more by the simple fact that learning a foreign language, in my humble opinion, does broaden the mind. The second bit that called my attention was this one on the right that puts the words grammar, reason, and testing together. 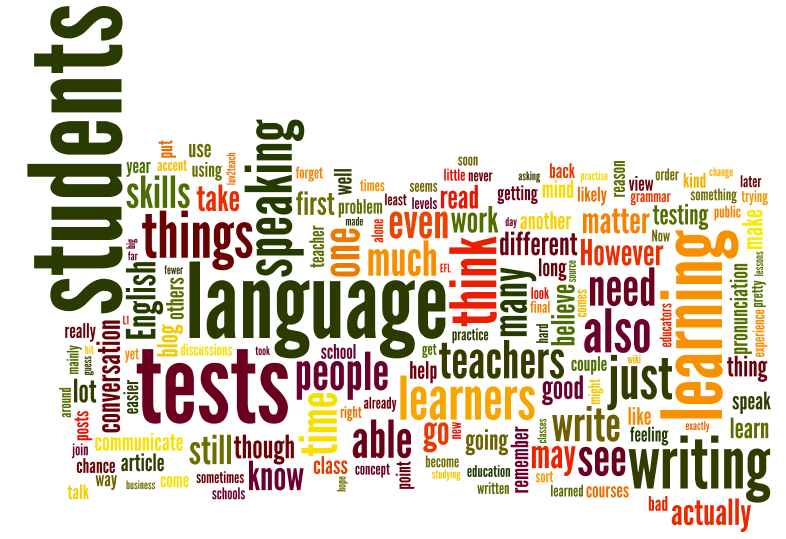 First, I’m not against tests and I see a good reason for them in the language classroom. However, if the only reason for testing is grammar in some kind of an order, this is likely to fail flat and not allow for learning opportunities. Tests have got to allow for learning opportunities. Otherwise, we’re just pretending to be testing learners, and they’re just pretending they’ve learned the subject for the test. Assessment is a lot different from testing, and teaching is a lot bigger than both. This was a rather interesting one and I guess pretty much all words are important, so I’ll just talk about it instead of pointing out the words. 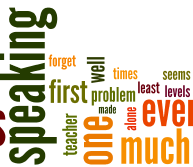 I guess speaking too much is one of the first problems one faces as a language teacher. there are, of course, times when it’s OK to forget about Teacher Talking Time (TTT) if you know what exactly you’re doing and depending on your approach to language learning. It also seems acceptable, at least for certain levels, to speak a bit more. If you want to teach well, just don’t forget you’re not alone in the classroom and always remember to take your students into account. This is also rather interesting. In spite of my personal interest in pronunciation, it’s not just about having a pretty accent. Learning involves many different things, such as grammar, vocabulary, pragmatics, speaking, listening, and reading. Learning, however, also needs writing. It’s not just about writing, obviously. 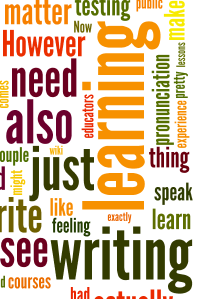 Nevertheless, I truly believe that pronunciation is not the only thing that is neglected in out teaching (for many different reasons), but so is writing. Perhaps we could also look at it more carefully, huh?! As a dogmeist, I couldn’t leave aside the bit of the cloud that deals with conversation. In a way, if we give our students a chance to talk and really communicate, it might be a lot easier for them to learn the language. Nevertheless, teachers cannot lose sight of the fact that mere conversation isn’t enough – learning has got to be the main point of the activities if we want our students to succeed and come across as independent users of the language. This last bit I’ve chosen to analyse might be a note to myself. Even though I’ve been feeling like writing more often, perhaps my writing isn’t exactly good. Has it actually gone bad? Has it ever been good? I mean, maybe it’s time I started changing the focus of the blog and the posts, which might perhaps help me improve on my reflections on teaching and learning. Or, you know what, maybe the blog should keep on as it was conceived – a place where I can share my views, hear other people’s voices on the matter, and finally be able to learn a tad more about what I was thinking. To be honest, I don’t expect it to be good or bad, as long as it was worth your time reading up to this point. And if you happen to have the time to leave a comment, or go through some of the old posts of mine I linked to throughout the post, even better! Great stuff Rick, I’m with Seburnt and Mario. Excellent, thoughtful analysis and to think I just did a quick tagxedo and shoved it up there. Shame on me! Wanna do mine for me as a guest post? Pretty please, ice-cream on top? Like the guest post plan…(although you’re just being lazy! 😉 as Dave says below, we could do this again, but maybe write about somebody else’s blog. Like a circle of guest posts or sth!? Richard, I quite enjoy the idea of revisiting the word clouds in a couple of weeks. And it would be nice if we could do it as a circle of guest posts. I myself haven’t written many guest post, nor had many people write guest posts here, for that matter, so I’d really enjoy the experience! Karenne, this is the best idea. Maybe we should all do each others…. I haven’t done one yet. Might be insightful…. I’ll join the line of people praising you for this contribution! 🙂 I love the section-by-section breakdown you give and the way you reconstructed the words to make your reflections. Top job – we should definitely repeat this challenge in a couple of month’s time! The mini-tour was something I’d been meaning to do for a while, and I’m glad it happened so naturally. To be honest, I hadn’t planned on doing it like that, it’s just as soon as I looked at the word cloud, words naturally came together! The other good thing that came out of this post was getting to your blog as well… I know I’ve been sort of away from blogs for about a month, but that’s probably one of the things I miss the most – reading and writing. Yours is a blog I’ll be visiting a lot more often from now on. You wanted people to comment – you got it! Always a pleasure reading what you’ve been thinking about. I think that this exercise is great way to reflect on your teaching/blogging… perhaps not because of the accuracy or scientific method of word choice, but just because it gets you to ‘think’ about the things you write. Your section where you question conversation alone as learning, rather we need to insist on the function of learning itself, cuts a chord with me. I feel that I do too much talking (STT) and not enough learning in my lessons, perhaps out of fear… do I know enough to teach them? General teacher insecurity. Great post, thanks… I’m trying to access Wordle as we speak. The old dilemma of TTT vs. STT vs. actual learning… it all depends on our learners and our groups, I suppose. I think you saw wordle the same way I did, then. Not only is it a lot of fun, but it does help us reflect on our writing.